The Premium and Pro users can now use the Collaboration tool allowing to modify and manage their website with others, from different accounts, without having to share their login information. How does it work? What possibilities does this feature offer? In which cases can it be used? This guide explains everything you need to know about this tool! How to configure the Collaboration tool? Select the roles that you want to assign to the collaborators of your website, by checking the appropriate boxes. 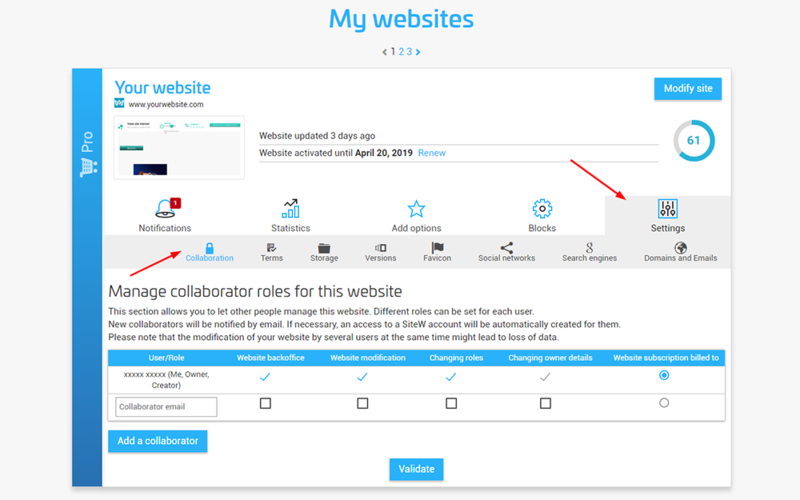 If the collaborator does not have a SiteW account, an invitation to collaborate will be sent to him, in the form of an email with a link to access SiteW. Each collaborator will be able to manage the website from the My Websites page. If you want to delete a collaborator, you just have to uncheck all his roles. You can set different roles for your collaborators. As seen above, you just need to check or uncheck the roles that you want to assign to the co-administrators of your website. Access to the website back office: this role enables to access the website statistics and the block control panel. Website modification: this function provides access to the website creation tool and to website settings. Warning: it is recommended to limit the number of people assigned to this role, because simultaneous modifications can lead to data loss. When another collaborator is using the website creation tool at the same time as you, you are notified of it on the modification page. Changing roles: this function is required to modify the roles of the collaborators, and also to add new co-administrators. Changing owner details: this role enables to modify the personal information and the email addresses of the website owner, and also to offer this possibility to other collaborators. When an administrator is assigned this role, the “Owner” tab appears in the settings. This tab provides access to the page allowing to modify the personal information of the website owner. Website subscription billed to: the personal information of the collaborator to whom this role has been assigned, is used to create the invoice. He is the one in charge of paying the subscription renewals, adding options, changing the website package. In some cases, this role will not be modifiable: for example, if the website has been created by a SiteW partner. In which cases can the collaboration tool be used? To delegate your website design, or the modification of your already existing website to a SiteW partner: so you can partly free yourself from the tasks related to the creation and management of your website, while remaining totally independent. To become a SiteW partner: you can therefore create websites for your clients, while allowing them to manage their own website. To manage several websites with different billing information, on the same SiteW account: this can be very useful if you have a professional and personal website. In that case, you just need to assign the billing role to different SiteW accounts, while maintaining access to all your website dashboards on the same account. To conclude, whether it be for a partnership with SiteW, to manage a personal website with friends or family members, or to share responsibility for the management of a company’s or an organization’s website, or even if you have several websites, the collaboration function will be useful for you. So start using it as soon as possible!